These five Earth-Kyba stories by legendary science-fiction master Harlan Ellison, winner of multiple Hugo, Nebula, and Edgar awards, have been specially adapted and fully illustrated in vibrant color by artist Ken Steacy. 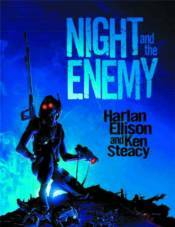 Unavailable for nearly three decades, this tale of the Earth's war with an alien race features a clever framing device specially written by Ellison that links the individual stories. Also includes Ellison's short story 'The Few, the Proud,' new Introductions by the creators, and six pages of new artwork.